ಹನ್ನೆರಡನೇ ಶತಮಾನದ “ಗಣೇಶ ಮತ್ತಿಬ್ಬರು ವಿಧ್ಯಾದರರ” ವಿಗ್ರಹ. ಪಾಲ ಸಾಮ್ರಾಜ್ಯದ ಕುರುಹು. The bejeweled elephant-headed God of Plenty, dancing on a plinth with his rat vehicle beneath, holding his attributes the battle axe and a bowl of sweets. 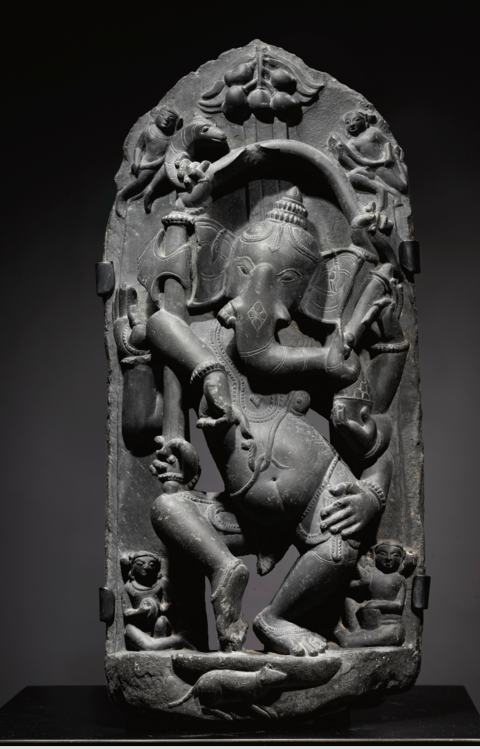 He lassoes a serpent above his head as two “vidyadharas” look on from either side. The apex of the stele is ornamented with a bunch of ripe mangoes. Beauty, simplicity and intricate art…….all in one!